PYC bearing is a specialized manufacturer of miniature ceramic bearings,ceramic speed bearings,abec 7 ceramic bearings,high speed ceramic bearings. PYC bearings are most sought after for use in applications such as; slot bearings , yoyo bearings , airsoft bearings , fishing bearings , rc bearings , skateboard bearings . Using Ceramic Speed bearings in hubs, bottom brackets, and pulleys will reduce friction. By reducing the coefficient of friction, you can accelerate faster and maintain speed with less power input. 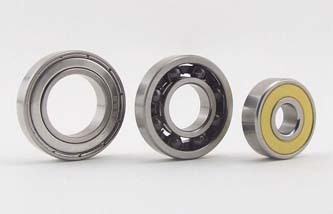 • Ceramic bearings have 10% less friction than steel bearings. • Bearings are extremely wear resistant because ceramic material is much harder than the hardest steel bearings. • Silicon nitride balls are 60% lighter than steel balls. • Safe operation even when using low amounts lubricant, which reduces the viscous drag friction from lubricant. • When used with special seals and lubrication, the friction in ceramic bearings can be 20-30 times lower than steel bearings with standard friction seals and standard lubrication. Wheelbuilder uses Ceramic Speed hybrid ceramic bearings for all high-end applications. Compared to all steel bearings, they have lower friction, lighter weight and longer service life. They are also less susceptible to failures caused by dirt, dust and poor lubrication.